Do you want to cut MOV video files without losing quality? Do you have MOV files created by iPhone, iPad or downloaded from the internet and want to share a special part of the video? Do you want to convert MOV to MP4? MOV (QuickTime Movie) is a multimedia file format developed by Apple and compatible with both Macintosh and Windows. MOV files are widely used in Apple products like QuickTime, iPhone, iPad and the like. 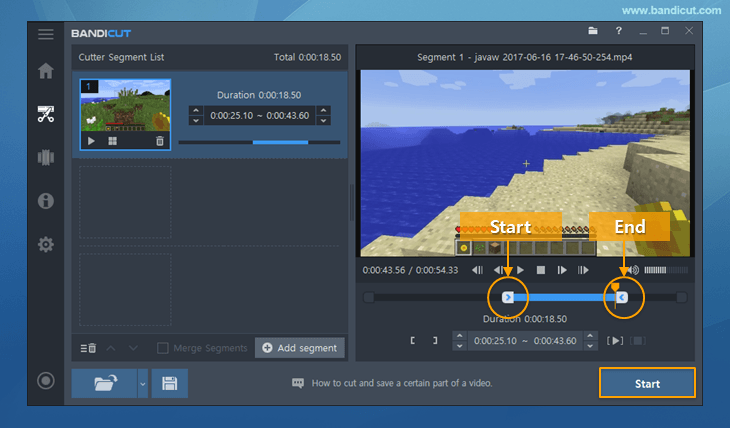 If you use Bandicut, you can cut, split, merge MOV video files in a few clicks. Bandicut is a professional video cutter program which allows you to cut parts of video quickly while keeping the original video quality. 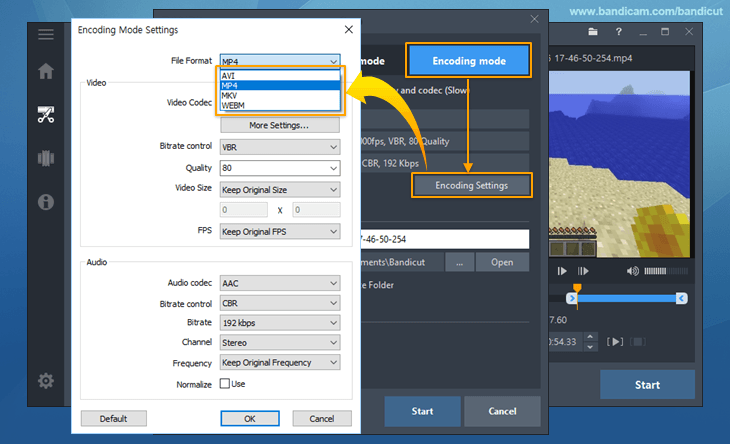 You can also easily cut mov videos by adjusting their start and end time by moving a slider and upload the clipped mov file to YouTube immediately after cutting. MOV is the most popular video file format for a Mac computer and most media players and video editors support the .mov movie format. However, some smartphones or mobile devices don't support the MOV file format. In this case, you have to convert MOV to MP4 through a video converting program. If you use the "Encoding mode" of Bandicut, you can convert MOV to MP4, AVI, MKV or WebM file formats. 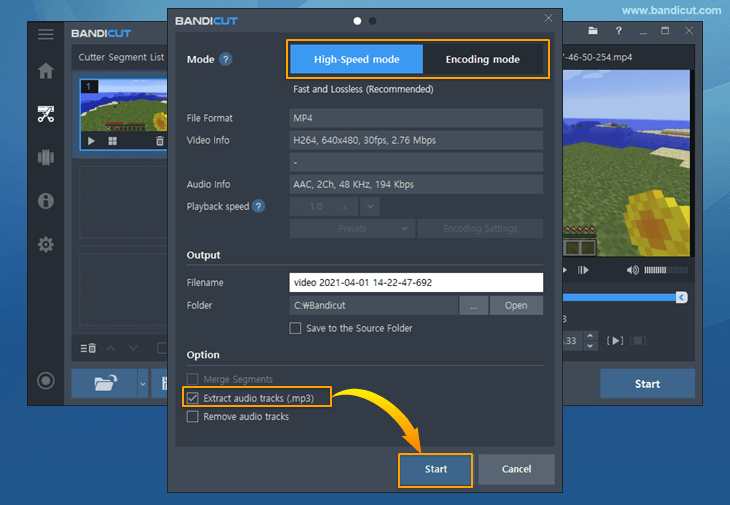 If you want to cut your favorite part from an MOV file and save the result as an MP3 file, please try the "Extract audio track (.mp3)" option of Bandicut. If you check the "Extract audio track (.mp3)" option, you can simply extract audio tracks (.mp3) from a video. 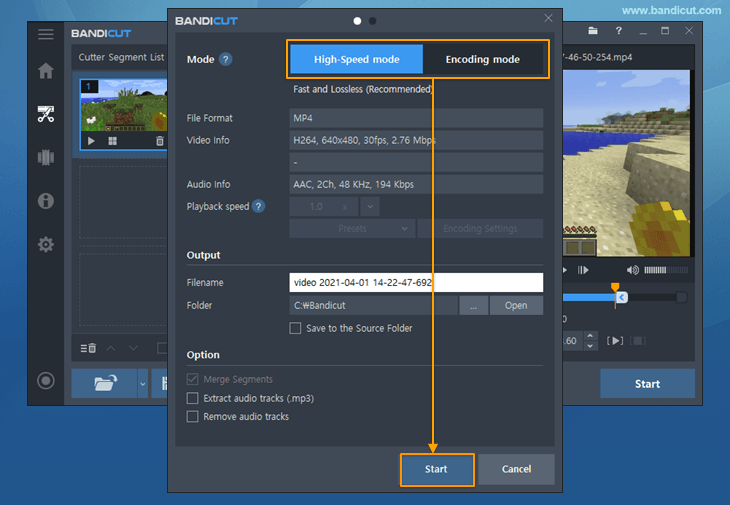 Download the free version of Bandicut and click the 'Cut' button to import the MOV file. 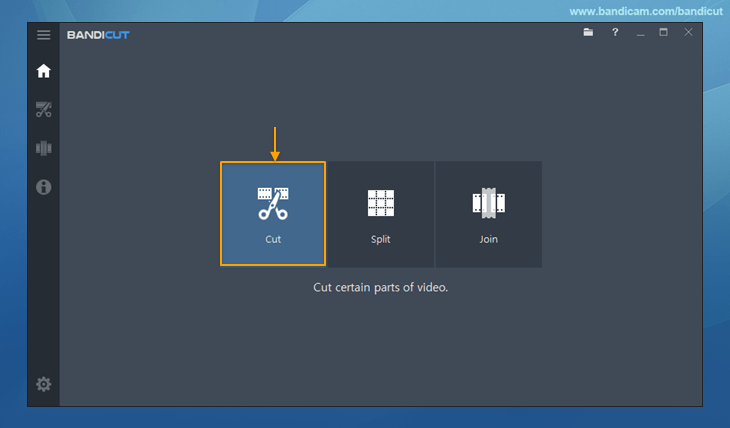 Click the 'Start' button on the pop-up window to initiate the MOV video cutting. You will be able to find the new clipped MOV file in the output folder.